Tons of dread advice is scouring the internet, and it can be a little difficult to determine what is good and what isn’t so good. Especially for those really wondering how to get dreads and where to even begin. For starters, doing your research is a great place to start, and hopefully, that’s why you’re here. By doing research, you will likely be able to wade through the good and bad and make educated choices on your own about where you would like to start your dread journey. One of the best and sometimes the most forgotten bits of advice is making sure that your hair is really clean before getting your dreads. Like, squeaky clean. This helps when starting dreads for a number of reasons. 1. It allows knots to form easier. Hair that is drier will dread easier and using shampoos will dry out your hair since we wash it with shampoo to get rid of grease from our scalps. 2. It starts everything on a clean and fresh head. There’s no use trying to dread your hair when it’s dirty. It’s like painting a wall covered in dirt and dust. It’s not a clean slate and odds are it will annoy you later on. A second and highly crucial piece of advice is a plan. Going in with a plan is going to make your dreading experience so much better. Find a trusted friend or two to start dreading with first. Preferably someone with some experience would best most helpful. This will aid in guidance and patience during the process. Also, a plan is necessary for the parts of your head. There are patterns and ways to dread your head so that they look best and fall in the best-looking way as they grow. This way, you stagger the chunks of hair that you are dreading, so there are not any clear, straight lines from your forehead to your crown. This is something that is terrible to forget and something that is nearly impossible to be undone. Now, it’s clearly suggested that you do your research but by doing so, reach out to experts and find out if they will mentor you through the process. 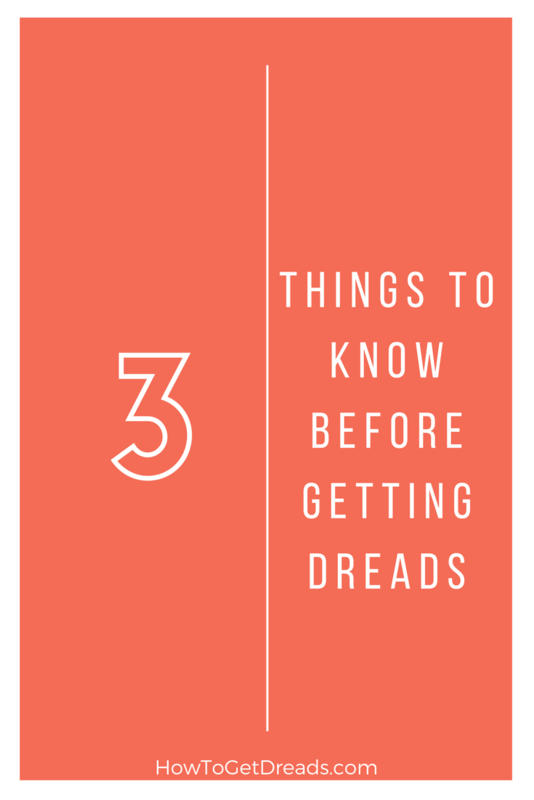 Getting dreads is a big decision, and it’s just like any other journey you might go on. Photographers and artists of all types find mentors to walk them through parts of their business journey. People who are getting their first tattoo find a mentor and learn more about tattoos before making an impulse decision. Heck, there are tons of women finding pregnancy mentors to help guide them through the ups and downs over nine months of creating life. There are people out there who do want to help you. They want you to avoid the mistakes they made and to educate those who are interested in the what they have found to be the best advice and best practices for getting, keeping, and growing strong and beautiful dreads. If you are looking to start you dreading journey, you won’t need much, but make sure that you take these three tips into consideration well before you start knotting. Doing this will ensure that one, this is the right decision for you at this time, and two, you can avoid mistakes other have made and have the best possible dreadlock journey.